Proposed Downtown Overlay to bring clarity and consistency to developers - The Resident Community News Group, Inc. | The Resident Community News Group, Inc. If District 5 City Councilwoman Lori Boyer has her way, it won’t just be new development on the North and Southbank that will change the face and feel of Downtown Jacksonville in the years ahead. For more than a year, Boyer has been coordinating with the Downtown Investment Authority, architects, developers and NAIOP, a commercial trade association of developers, owners and professionals of industrial and mixed-use real estate, to revise the current Downtown Overlay Ordinance. Her goal is to simplify and bring consistency and clarity to the building standards used by property owners and developers. “This needs widespread buy-in,” said Boyer, who is currently circulating a rough draft of the document for comment from stakeholders before presenting the proposed legislation as an ordinance to the City Council in February. The current overlay ordinance combined with the existing 15 zoning codes, which regulate how buildings can be built Downtown by governing height, setbacks, lot coverage and uses, directs how property owners and developers can utilize their property. 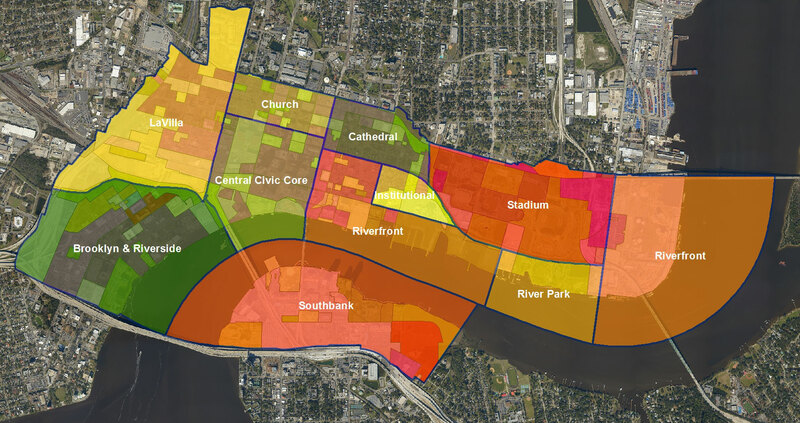 By overlapping the city’s zoning code, the overlay currently divides Downtown into 11 districts, which provide additional bonus uses to property owners and developers. Currently, it is not unusual for two side-by-side downtown lots to have different underlying zoning, Boyer said. For instance, a lot zoned RLD-60 (Residential Low Density-60) with a 35-foot height limit, could be next door to a CCG-1 (Commercial Community General-1) lot, with a height limit of 60 feet, with both lots residing in a district where the bonus use is residential. With the new legislation, Boyer plans to completely change both the zoning and the overlay. Her revised plan removes the various underlying zoning codes and converts the entire Downtown area to CCBD (Commercial Central Business District), removing height restrictions for non-riverfront building construction and reducing the number of districts within the downtown area to eight. “My overlay would have fewer districts and would go in the opposite direction,” she said. “It gives developers everything they might want with CCBD uniform zoning and then says what cannot be done in each individual district. That takes away certain uses that would be inappropriate for those areas Downtown,” she said, noting that certain districts, such as the LaVilla district, would have height limitations. “Most of Downtown would have unlimited heights. For instance, I don’t care what the heights are by the stadium. It can be 70 feet or 250 feet. It really doesn’t matter. What we want to do is take away the patchwork of heights and uses and make a broad brush of areas where the uses and heights are similar in the districts,” Boyer said. Also included in the plan will be consistent Downtown design standards such as setbacks, architectural standards, sidewalks and shade requirements, which won’t be segregated by district. “All of Downtown has a build-to line. This isn’t new, but we cleaned up all these things to make sure they are updated and are according to current design practices,” she said, using the “old rooftop standard” established 15 years ago to illustrate. The old standard insists rooftop air conditioners be set back from the edge of the building so they cannot be viewed from the street, while her new standard acknowledges that the city now consists of restaurants and bars with rooftop seating and buildings with rooftop swimming pools. The new ordinance not only insists that rooftop air conditioners be set back on the roof, but also that they be screened from view so someone looking down on them can’t see them, she said. Also updated within the ordinance are the River Park Design Standards that were adopted in 2001 to regulate standards pertaining to the Riverwalk. With help from Jill Enz in the City Parks Department, Boyer’s plan has modernized the specifications for benches, trash cans, landscaping materials and other fixtures that are no longer appropriate.